Syria’s Idlib province is the last major stronghold in the country infested with US-supported terrorists. Led by elite Syrian Tiger forces, government troops are mobilizing for an offensive to liberate the province, aided by Russian airpower. Russian reconnaissance flights have been monitoring Iblib’s southern and western countrysides, tracking movements of heavily armed US-supported terrorists. The offensive is set to be launched in the coming days, fierce resistance likely. The greatest obstacle Syrian forces face is US opposition to resolving the conflict it initiated for regime change. Are Washington and Britain planning another Chemical Weapons false flag incident this time in Idlib province, intending to wrongfully blame it on Assad – a pretext for US-led terror-bombing of Syrian military and other targets like earlier. Fact: No evidence suggests government forces used CWs at any time throughout years of US-sponsored naked aggression in the country. Fact: Plenty of evidence indisputably proved that US-supported terrorists used CWs many times, mainly against civilians, Damascus falsely blamed for their high crimes. 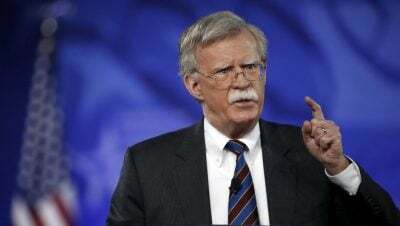 Bolton lied calling Israeli terror-bombing of Syrian targets “self-defense.” US claims about combating the scourge of ISIS in Syria it supports is another bald-faced lie. On Wednesday, the Syrian Arab News Agency (SANA) reported that al-Qaeda-linked White Helmets are preparing to stage another (false flag) CW attack – in Idlib province to be wrongfully blamed on government forces. A joint US, UK, French statement said a military response would follow another CW incident, similar to their mid-April aggression, falsely accusing Syria of using CWs at the time. Sergey Lavrov slammed a secret world body directive prepared last year. Secretary-General Antonio Guterres has prohibited UN agencies from involvement in rebuilding liberated Syrian areas until (US-plotted) “political transition” (regime change) in the country is achieved. The document titled “Parameters and Principles of UN Assistance in Syria” was clearly prepared on orders from Washington, Guterres aiding its imperial agenda in Syria and elsewhere – circumventing the Security Council, breaching its resolutions on Syria, other international law and the UN Charter. Lavrov slammed his complicity with Washington’s “absolutely destructive” agenda, obstructing conflict resolution and reconstruction in Syria. Guterres secretly prohibited UN agencies “from participating in any kind of projects aimed at restoring the Syrian economy,” said Lavrov. The Trump regime and its imperial allies want endless war for regime change continued – a high crime supported by Guterres.